It’s not crystal clear when the club started, but based on early newsletters, 1981 appears to be the first “official” year. This was the year that a regular newsletter began to appear. It wasn’t the Toledo Area Bicyclists in those days; it was the Toledo Bicycle Touring Society (TBTS). Charter TAB Member Sue Wilson is shown at right with a TBTS jersey from this early era of the club. While the club had a newsletter, the newsletter didn’t have a name. The founding of TAB is attributed to Steve Dosick, a vascular surgeon with Toledo Hospital, who organized it for Toledo Hospital employees. In 2004 in a letter to the club’s newsletter, Steve noted that a group began getting together in 1978 or 1979 as part of a physical improvement program. It was a program already established by the hospital that the cycling enthusiasts tapped into. Early cycling participants were nurses, respiratory and physical therapists, social workers and doctors. The group had occasionally made the 45-minute car ride up to Ann Arbor to ride with the Ann Arbor Touring Society. Steve said the only other organized group in Toledo was a racing group, so the Toledo Bicycle Touring Society was formed to meet the needs of a broader cycling age and skill level, and save that car ride up to Ann Arbor. In these early years, TBTS had hospital support. Membership checks were made out to Toledo Hospital, and monthly membership meetings were held at Toledo Hospital- affiliated locations. Toledo Hospital provided secretarial, printing and accounting support up until about mid-1986. Steve also served as the club’s first president from 1981 through 1983, and regularly had informational articles in the newsletter about exercise and health and cycling-related topics. Steve died in 2008 from pancreatic cancer at age 65, a few days before TAB’s banquet that year. 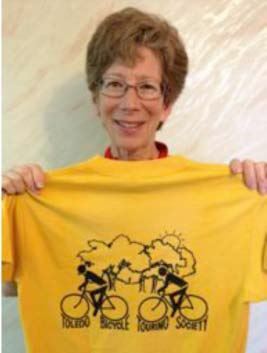 Sue Wilson, perhaps the only charter member of the club who is still a member today, heard from a friend at the hospital about a group of people who were going out on rides on Saturday mornings. She played some tennis and enjoyed walking, especially when she was in England for an extended period, and was interested in taking up cycling as another form of activity. Her 5-speed Schwinn Collegiate had been sitting for a few years in a storage locker and now was out again riding in a group. Sue talks about her first riding experience with what would become TAB: The group rode three distance loops, and I thought I would try the shortest loop of 15 miles. I think we met at Ft. Meigs. I started out with a small group, and when we reached the point to turn for 15 miles, I discovered that the rest of the group was going to ride 25 miles. They all encouraged me to do the distance with them, and shared their snacks and water bottles with me. When we finished, I was so exhausted, I almost fell asleep driving home in the car. But I really liked the feel of being on the bike, and moving under my own power, so I worked on it and rode almost every Saturday with the group. This was probably in July 1980 when Sue returned from England. Sue recollects people discussing a name for the group, so it probably wasn’t in effect until about the start of 1981. In these early years, Sue served as Vice President and Ride Coordinator and has continued her active volunteering for club activities through all the years. Charlie Schrader was an early member of the club and its president from 1989 through 1991. Those of you who have ridden the Sunday morning breakfast ride to Metamora in recent years probably rode with Charlie now and again. That wasn’t the only hat Charlie wore in the early days, as it was tough to get volunteers, forcing those who did volunteer to shoulder multiple responsibilities. Several newsletters contain both a letter from President Charlie and a form for returning membership applications/renewals to Membership Chairman Charlie. Along the way, he also held several other titles, including Vice President, Treasurer and Ride Coordinator. He said he continued as Ride Coordinator after his presidency to help ensure he kept coming out for rides. Charlie says finding officers was probably the club’s biggest challenge back then. Similar to today, in these early years, there was camaraderie with members of the American Youth Hostels (AYH) group (which became Hosteling International-Toledo area and then Maumee Valley Adventurers). Pat and Ray Squire recall becoming acquainted with TBTS in the summer of 1981 when John Keller, whom they knew through AYH, invited them on a ride. John, one of the first members of TBTS, died in 1998, and for several years thereafter, our Volunteer of the Year award was named after him due to his substantial volunteer contributions to our club. Rick Metcalf’s uncle, Ted Metcalf, was John’s main riding buddy in later years. Pat and Ray remember meeting Sue Wilson on that first ride, as well as Steve Dosick. They joined the club the next year (Ray and Pat are wearing vintage TBTS shirts in the photo below). The club had modest beginnings. Mel Wicks recalls joining TAB in 1983 or 1984. He attended a presentation at the Riverside Center for Health Promotion, at which a TBTS member was going to show a slide presentation of a recent ride. In those days, it was pretty common for members to take photos on cycling trips, which turned into slides that were shown at monthly meetings. When Mel got there, he said Charlie was setting up the slides and Jack Lykes, president in 1984 and 1985, was the only other person in the room. Mel says nobody else showed up, which didn’t discourage him from joining. It’s also important to mention that we owe the name of our newsletter, The Seat Post, to Mel. He submitted the name that first appeared on the January 1996 newsletter. Although Charlie says he didn’t take photos, an article he penned for the fall 1988 newsletter mentions a slide show being put together for a trip that he and others took to Europe, which would be shown at an upcoming meeting. Sue Wilson was on that trip, as was Bev Wolcott. Bev, who served as an officer of the club (including Vice President and Treasurer) and in a wide variety of other positions for many years, joined the club in the mid-80s. 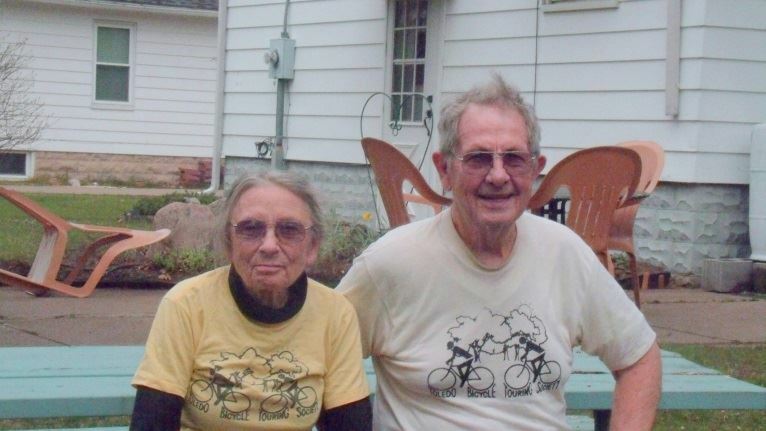 In those early years, the Saturday morning ride was the club’s staple, and knowing she liked to ride, her dentist, club member Bob Weisenberger, told her she should come out and join a ride some Saturday. She did just that for a ride around Put- in-Bay, and developed some friendships that led her to join the club. In May 1982, President Dosick announced in the newsletter that TBTS was going to start charging membership dues – $5.00. An $8.00 family membership was added a couple months later. Steve also announced a 50-cent fee for non-members to participate in club rides. Lou McLove was president of TAB from 1993-1995 and director of MARR for its first five years. He recalls that for about a year he paid the non-member 50 cents to ride with club members on Saturday mornings. Lou was showing up more than most members, and Charlie asked why he didn’t just join. Lou told him that every time he joined an organization, he ended up being an officer. Charlie assured him that wouldn’t happen, but, of course, Lou joined and the next year he was an officer. Saturday rides started from a wide variety of locations. Ft. Meigs may have been the most popular starting point, but rides also began at Woodville City Park, Sylvania Northview High School, the Southwyck Lion Store, Secor Park, Strawberry Acres Park in Holland, Pearson Park, the Lane Drug Store in Waterville, Northtowne Mall, Ellis Park in Blissfield and Mary Jane Thurston Park in Grand Rapids. Rides also began from local bike shops including The Bike Route, home forever on Monroe St.; The Road Racer on S. East Boundary in Perrysburg; and Hart’s Cyclery on Heatherdowns. Sue recalls that for at least the first couple of years, several people took part in leading the Saturday ride. They were expected to map out three loops of varying distances. Early newsletters say rides were from 20 to 75 miles. The Saturday morning rides sound a bit like our Thursday night rides now – different alternatives for different levels of riders. The whole group rode together for a while and then split off depending on the distance each was riding. Ride leaders were expected to drive the loops before the ride to make sure all the roads matched up with the maps. Quite a file of maps was put together because each week had different routes. Pat mentions that Mike Essi provided many of the maps (Mike wrote a regular column in the newsletter titled “Maintenance Spokesman”). Charlie says he has quite a large collection of these maps that he has been trying to pass on to someone for years. Now that TAB’s Saturday morning rides have returned to the varying starting points, maybe someone has an interest in Charlie’s cache. While Saturday morning was the only club ride early on, Lou also remembers going out on very early Sunday morning rides with some members – 5:00 or 5:30. He said, not unexpectantly, very few showed up for this ride, which he describes as some “pretty strange routes.” More “normal” Sunday rides also began, at first with varying starting points and then switching to a standard start. In the early 90s, Bev led a 20- to 25-mile “Ladies Ride” on Tuesdays for a few years. Thursday night rides from Side Cut Metropark started in the early 90s and were advertised as being “fast-paced.” In the mid-80s, there was also a Wednesday ride of 10 to 15 miles that was advertised as being slow-paced and a good one for novices. One thing in particular stands out about Saturday rides with ride leader Charlie – they left on time. That meant when 8:00 or 9:00 rolled around, Charlie was on his bike and out of the parking lot. You better hop on, or you were going to be following a map. Charlie also shared one of his “map secrets.” He learned that most Saturday riders didn’t like rides that were 70 miles or longer. There were occasions when routes Charlie marked out ran beyond that 70-mile threshold. Not to be deterred, he always made sure the maps never said more than 69 miles, no matter how long the ride really was. Charlie was one of those riders who didn’t like to get out his bike if the ride was less than 50 miles. Beginning in the early 1980s, TBTS was involved in one of largest rides around, with 2,000+ riders. It was the Tour Along the South Shore of Lake Erie, or TASSLE. TBTS was one of four clubs sponsoring the ride along with the Lake Erie Wheelers, Sandusky Bike Club and Fremont Bike Club. The early newsletters contain annual appeals to get club members to volunteer for TASSLE, which many members did. Pat Squire rode on every TASSLE from 1980 through 1992 and describes the TASSLE experience: It had two starting locations (west side of Cleveland and the Oregon YMCA). Lunch was in Sandusky. One could ride a half-TASSLE, overnighting in Sandusky, or full-TASSLE, starting at either end and overnighting in the opposite location. Other options included a one-day TASSLE, starting at either end with a turnaround in Sandusky, and the ultimate double-TASSLE (200 miles in a 24-hour period). The various clubs staffed registration locations and food stops, overnight sleeping bag locations and dinners. Supplies and luggage were transported by rental truck. The event was founded by Dave Fortier, a Lake Erie Wheeler, Brunswick High School chemistry teacher and mayor of Olmsted Falls. He incorporated it with a 12-member (working) board of directors. The name was trademarked and actual tassels were awarded to each finisher, with the color depending upon the distance ridden. Each club had a specified number of directors, with TBTS having either two or three slots on the board. In the late 1980s, Jack Lykes and I (first female director) became TBTS’ representatives on the board. TBTS’ responsibilities included painting pavement arrows on the route west of Sandusky, staffing registration and the sleeping bag location at the Oregon Y, and the Liberty Benton school rest stop. We also arranged for the Saturday evening dinner and supplying SAGs for west of Sandusky. Some riders opted for a hotel overnight (Hillcrest, I seem to remember) instead of sleeping bag space. Tragically, TASSLE’s founder was killed in a car accident in 1986. The remaining directors and their clubs tried to keep the event going, but Pat said that Dave Fortier’s time and energy were a lot to lose. The event struggled for a few years before directors ended it in 1992. The equipment and supplies were distributed to sponsoring clubs. Pat notes that TBTS got eight coolers, seven of which over 20 years later are still being used for MARR and other activities (the other cooler disappeared off Pat and Ray’s front porch). Rick Rump joined the club in 1992 after meeting Lou and Bev at a Perrysburg school that was the starting point for the American Lung Association’s Clean Air Challenge. It was the first of two or three years that the club set up a table at the ride, at which members talked about club activities, passed out membership applications and had a drawing for prizes. One of Rick’s earliest memories after joining was TAB’s support of the Glass City Marathon. Bev was the driver behind our manning a water stop for the run. In addition to cycling, Bev was a runner and a member of the Toledo Roadrunners. She knew that it would be fun to get our group of cyclists together and support a similar- minded club. You could expect sometime after the first of the year that Bev would put out a call for volunteers for the April event. There could be 20 or more members who came out. For many years of our support, we manned the first stop after runners came off the High Level Bridge and headed down Miami Street. One or two years, Bev asked several people to bring their bikes along, and with a row of bikes parked along the curb, it not only looked cool, but helped promote who we were. After that, there were members who rode their bikes to the water stop, and on good weather days, several more went out for a ride afterwards. Rick says his memory may be shaky, but he remembers most of the mornings he showed up as being pretty chilly, especially since volunteers were getting there early in the morning to set up for the first stop. It was tough to show up in a short-sleeved cycling jersey. As the years passed, it was also fun to cheer on club members who were taking part in the run as they passed by our stop. In later years, TAB was moved to a couple different locations, and participation began to wane until finally ending. But for about 15 years, Bev organized a highly supportive group. 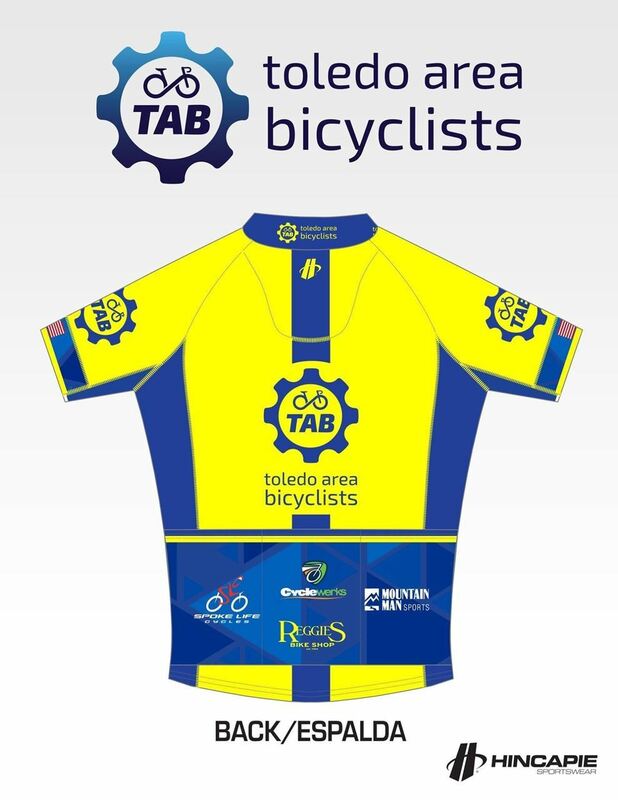 Since then, TAB members have volunteered to ride with the leading runners in various marathon classes. There were other activities outside of club rides that members took part in. Lou recalls the picnics the club held. The first he went to was at “Dr. Bob’s,” Bob Weisenberger’s, Bev’s dentist. He had a farm with a large pond outside Pemberville. For several years, the club held its annual picnic at Clear Water Quarry, and Bev remembers them as being fun afternoons of swimming, sunning and enjoying a delicious cookout. Saturday rides also occasionally took on more of a social feel, when rides would go to Harrison Lake or Wamplers Lake in Michigan and riders would break for a swim before pedaling home. Hidden Lake Gardens was also a Michigan destination. 1994 was a historic year for the club. 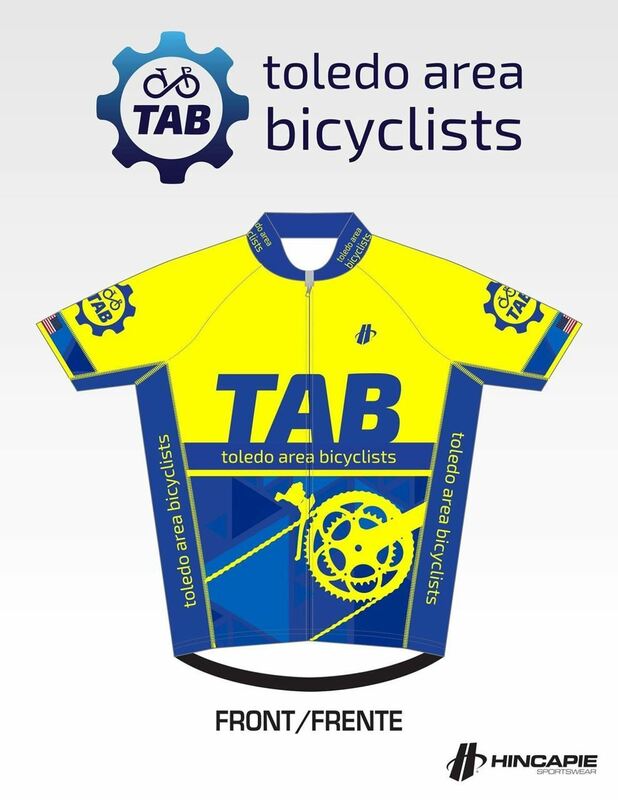 It was the first year of the Mad Anthony River Rally, and it was the year the club became the Toledo Area Bicyclists (TAB). As Bev recalls, a group of 10 to 12 TBTS members met at Charlie’s home to talk about changing the club’s name. Charlie said the reason for the change was that members were always being asked where they toured. But members weren’t often touring in the traditional sense of loading up a bike and taking off on a venture for several days or more (like Rick Metcalf, Hubert Backes, Ron Toneff and a few other members have taken up in recent years). So the “touring” name had little relevance. Bev was less pragmatic in saying that Toledo Bicycle Touring Society sounded like “a bunch of old folks out for a leisurely pedal.” It does conjure up visions of ladies in long skirts and wide-brimmed hats and gentlemen in suits and bowlers on high-wheelers. In December 1994, the TAB name was adopted and was announced to the club in the spring 1995 newsletter. These early members of the club note that many things have changed since the early years, and some things are the same. Lou mentions that trying to keep everyone happy was a challenge – some members ride too fast, some ride too slow, the route is bad – challenges we still hear about today. The rides seemed more social and casual then. That isn’t to say that the club didn’t have its “big dogs,” as Bev refers to them. Board members are working on a new mission for the club, and the mission-related themes that came out from my interviews ring as true today as in the early days– bringing people together to share the love of cycling, promoting exercising and cycling’s healthful benefits, bicycling safely, good personal and environmental health through cycling, how to get more people involved, making rides more welcoming to less experienced riders. Thank you to Bev Wolcott and Lou McLove, Charlie Schrader, Pat and Ray Squire, Sue Wilson, and Mel and Annette Wicks for taking the time to share memories. They, as well as several others from those earlier times, were instrumental in keeping TAB moving forward and helping it to grow. We owe them a debt of gratitude for all they contributed in enabling us to still enjoy TAB today, years from its beginning.